Oklahoma Connection | Love was born in Oklahoma City, Oklahoma. In 1972 Tom Love acquired a convenience store in Guymon, Oklahoma, added fuel pumps, and opened Love’s Country Store – the first shop in the country to combine gasoline and grocery sale items. Tom E. Love, Oklahoma native and Executive Chairman of Love’s Travel Stops & Country Stores, graduated from St. Gregory’s High School and College in Shawnee, Oklahoma, before attending Saint John’s University in Minnesota and the University of Oklahoma and serving in the Marines. In 1964, Tom and his wife Judy opened their first filling station in Watonga, Oklahoma. Over the next eight years, Mr. Love opened an additional 40 gas stations across Oklahoma and surrounding states. In 1981, Love’s opened its first travel stop on Interstate 40 in Amarillo, Texas. In 2015, Love’s has more than 360 travel stop and convenience store locations in 40 states. Love’s ranked No. 14 on the Forbes 2015 America’s Largest Private Companies list. Mr. Love has been involved in both state and national activities, serving as member of St. Gregory University’s board of trustees, president of the National Oil Jobber’s Council and chairman of the Oklahoma Transportation Commission. Additionally, he was chairman of the Oklahoma Business Roundtable and currently serves on the board of the National Cowboy and Western Heritage Museum. 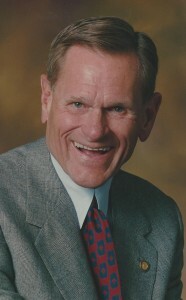 Mr. Love has received many honors including the “Corporation of the Year” award in 1991 and the 1996 President’s Awards for Service to God and Country. He is an inductee in the Sales and Marketing Executives Internal Academy of Achievement and the Oklahoma Commerce and Industry Hall of Honor. Additionally, Mr. Love was chosen as Oklahoma’s Most Admired CEO in his field in 2010 and awarded the Annual Trust Guardian of Transportation Award in 2014. See pictures of Tom E. Love and other media HERE.